Ah, Poldark. Manly Aidan Turner brooding and scything. Lovely ladies in elegant dresses and … wait, WHAT’S GOING ON WITH THEIR HAIR? Yes, it’s part 2 of my rant about the hair in BBC’s Poldark, 2015! (Missed part 1? Read that first, because this is mostly going to be chatty, not research-y. Part 1 has all the research!). Today, let’s talk about Demelza and that ball scene and the lower-class ladies. Interested in learning more about 18th-century hair and wigs? Want to try making your own? 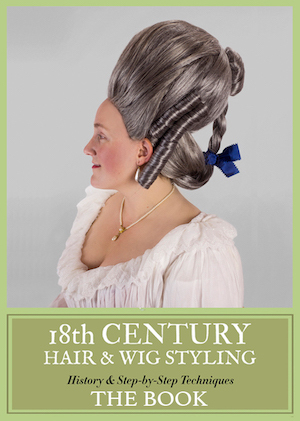 Check out Kendra’s book, 18th-Century Hair and Wig Styling: History and Step-by-Step Techniques! First, Demelza! She starts as a ragged person of indeterminate gender and blossoms into a lovely lady, and along the way, she actually ends up with more historically accurate hair than anyone else in the series! Okay, it’s still up in back, but the silhouette — and, particularly, the various ways she wears ribbons in her hair — are far more accurate to the late 18th century than anyone else. Okay, so it’s probably more 1790s than 1784-5, but I’ll take it. Part of me wonders why her hair is more appropriate than Elizabeth’s, but I guess we’re supposed to see Demelza as more romantic, so she goes tousled while Elizabeth goes structured. LISTEN, DESIGNERS. IN THE 18TH CENTURY, SMALL CHILDREN WEAR THEIR HAIR DOWN. Remember reading Little House on the Prairie? Or Rebecca of Sunnybrook Farm? I assure you, they all had a scene where the protagonist was Super Excited because she got to start wearing her hair up which meant she was An Adult Now. Okay, so those are 19th century, and my memory is fuzzy, but whatever. If not in those books, then in something! Also at the ball, George Warleggan gets his wig ON like Donkey Kong! The guy is dapper as hell in this fabulous number. He may be a twit, but I’d happily run off with him if he promised to keep wearing this wig. Powder! Short on top with a fabulous rolled-towards-the-parting! Side rolls! TWO braids in back! Be still my beating heart! Dark-haired lady: pretty! Lighter-haired lady: derp! Aunt Agatha pretty much always rocks the shorter, curly, slightly puffy hairstyle covered by a cap (see the left-hand picture below). But I’d like to give major props to the hair designer who styled Aunt Agatha’s hair for the Christmas party! Instead of tousled curls, her hair has been put into organized curls in the “tête de mouton” style. This French term translates as “sheep’s head,” and it was the name of a hairstyle popular in the 1750s and 1760s, which consisted of rows of organized curls worn from ear to ear, perpendicular to the hairline. Again, this places Aunt Agatha’s style apogee in the 1750s to ’60s, which coordinates with her wardrobe, and is perfect for an elderly lady hanging on to “her” style! Portrait of a Frenchwoman by Jean-Etienne Liotard showing the tête de mouton hairstyle, 1750s. Now, let’s look at the lower-class ladies. I’m not going to get in-depth into each character — instead, I want to touch on just a few points. First, our saucy minx Keren. You know she’s not all straight and narrow — why? Because of her perma-tousled hair! I go back and forth on whether or not this works for me, historically speaking. It’s AWFULLY messy and in the period, she’d probably be seen as crazy and/or a total slattern. But it does work, cinematically, to let the viewer know that Keren isn’t really concerned with appearing proper. Let’s pause to appreciate her fabulously ridiculous OTT wig that she wears for the theater performance. I love it! It’s like Elizabethan on crack. Finally, let’s look at the real down-and-dirty poor ladies. First, I’d like to show you a compilation of images of lower class ladies, most of whom are from artworks that are actually painted/drawn/set in Cornwall. Okay, probably many of them are romanticized, but at least half of them seem to be going for a gritty look. Let’s look at them and count just how many show 1) the hair worn completely down, or 2) the hair worn messy, with lots of strands and tendrils hanging out. I count two messy styles, and all the rest look pretty well up and organized. Now, let’s compare that to Poldark‘s poor women, who have hair ALL OVER THE PLACE. I swear, if you stripped them down, they’d have hair on the soles of their feet — that’s how much messy, stringy, tousled hair is hanging around. I particularly love the second image from the left, with the hard-living fisherwomen staring out to sea. I’ll bet they can’t wait for the fish to come in, so they can get allll that hair in their eyes/mouth/face/etc. while they slice out fish guts! What did you like when it comes to the hairstyles in Poldark, and what made you groan out loud? Share in the comments! And don’t forget to check out Kendra’s book, 18th-Century Hair and Wig Styling: History and Step-by-Step Techniques! And why does Ross never seem to pay any attention to his hair? There seems to be a notion on the part of a great many hairdressers that that men before the mullet just let their hair run wild or they dunked it in a vat of oil, then tormented it with a rake. Especially true for older historical periods, at least as they are popularly depicted. Considering that a comb is one of the most commonly found artifacts in archaeological digs, I doubt it. By the age of short hair, oil had been rediscovered, leading to the rise of the antimacassar. Siigghh I’m so glad someone else is driven crazy by this hair-all-over-the-place. I’m really enjoying the series but it makes me feel a wee bit o’ rage when I see 18thc working women with hair down. I have waist-length hair and even in this day and age of lovely conditioners and detanglers it is a b**** to keep clean, tangle-free, and out of the way…I have it in a bun 90% of the time and I’m just a desk-sitting librarian. Manual labor with long hair down is beyond stupid. For one thing, the snakey strangly sweaty feeling around the neck? It’s the WORST. And then making sure it doesn’t get caught in whatever you’re working on…yeah any woman who actually has long hair would never dream of leaving it down for labor. So you’re the librarian with the hair up and the glasses on…but seriously, I love long hair on a woman as much as the next guy, but I know from my years in the 17th century that long hair has its problems, and historically women, especially working women, kept it up and out of the way, largely with caps. Biggest reason for being in love with this is I can show my husband who gives me a look like I am a crazy person when I rant about this (come on I listen to him rant about sports), that I am not the ONLY one. Second reason is why does this not bother more people. You are the BBC for heavens sake. You probably have original wigs to model this on found in someone’s attic. I realize their annual reproductions of Austin and Bronte novels make their center of expertise a little later but shouldn’t that just highlight the fact if you are using that hair style you are in the wrong CENTURY. Yes, Laura Ingles Wilder wrote her auto-biographical feelings about now I am an adult I get to put my hair up like EVERYONE does. Fictionally also yes in Rebecca and I will kick in Anne of Green Gables to boot. I even confirmed the complaint on I can’t wait to put my hair up because my braids catch in my boot buttons as an actual thing experienced by my great aunts and grandmother as a thing. I have two of their boot button hooks still in my life. It is not only the common women with the flyaway hair. Demelza and Elisabeth regularly trot around with their long hair down (usually flying madly in the wind) or at most with the top pulled back. 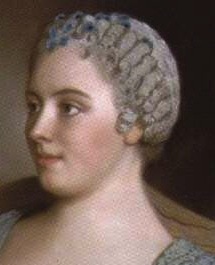 I grant that hairstyles were becoming more relaxed in the 1780s, but women simply did not wear their hair down as a matter of course int he 18th century. It is very cinematic, and I am sure that is why it is done, but it is not correct for the period. The hair flowing everywhere drives me nuts! Women with long hair – especially when there’s wind – braid it or pile it on their head And where are their head coverings? Can’t fathom what the hairdressers on this show are doing. I understand wanting to make the actors/actresses look appealing, but some drive toward authenticity would be nice too. The hair. The HAIR. OMG why? I’ve noticed that in the later seasons of Poldark, they’ve started to make more of an effort with Ross’s hair. Gone are the days of the untamed “man bob” as you put it (really made me laugh a lot). His hair in season 3 looked like a gross matted mess. But in seasons 2 is was much shorter and then again in season 4, it’s less curly – kind of looks like he had it blow dried. I’ve seen still from season 5 and his hair looks completely straight (sad because I love curly hair). I’d love to know your thoughts on the change of Ross’s barnet.